The planet’s largest and most powerful driver of climate changes from one year to the next, the El Niño Southern Oscillation in the tropical Pacific Ocean, was believed to have been weaker in ancient times due to the different configuration of the Earth’s orbit. However, scientists analyzing 25-foot high piles of ancient shells have uncovered new information that has led them to believe that the El Niños 10,000 years ago were just as strong and frequent as the ones that we still experience today. The findings, from the University of Washington and University of Montpellier, question the accuracy of computer models in reproducing historical El Niño cycles, or predict how they could alter under future climates. The paper can now be accessed online and will appear in an upcoming issue of Science. 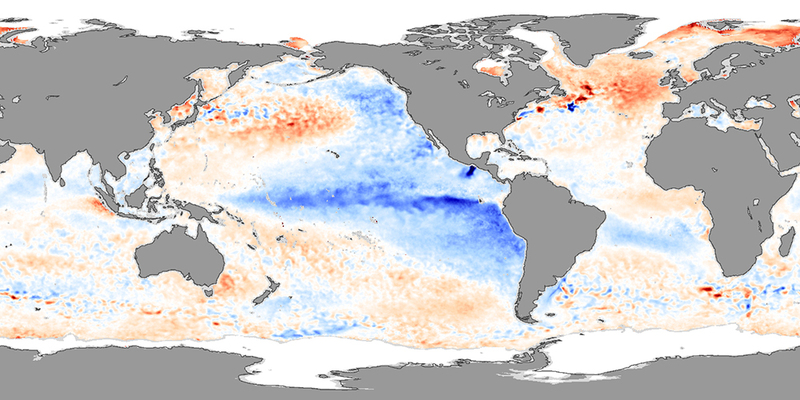 “We thought we understood what influences the El Niño mode of climate variation, and we’ve been able to show that we actually don’t understand it very well,” said Julian Sachs, a UW professor of oceanography. The ancient shellfish feasts also upend a widely held interpretation of past climate. “Our data contradicts the hypothesis that El Niño activity was very reduced 10,000 years ago, and then slowly increased since then,” said first author Matthieu Carré, who conducted the research as a UW postdoctoral researcher and now holds a faculty position at the University of Montpellier, France. Back in 2007, while at the UW-based Joint Institute for the Study of the Atmosphere and Ocean, Carré accompanied a group of archaeologists to seven coastal sites in Peru. Together they sampled 25-foot high piles of shells from Mesodesma donacium clams eaten and then discarded over centuries into piles that archaeologists have named middens. While attending graduate school, Carré developed a technique to analyze shell layers to obtain ocean temperatures, using carbon dating of charcoal from fires to get the year, and the ratio of oxygen isotopes in the growth layers to get the water temperatures as the shell was forming. The shells offer 1-to-3-year-long records of monthly temperatures of the Pacific Ocean along Peru’s coastline. Combining layers of shells from each site gives water temperatures for intervals spanning from 100 to 1,000 years during the past 10,000 years. The new records show that 10,000 years ago the El Niño cycles were strong, contradicting the current leading interpretations. Approximately 7,000 years ago the shells show a shift to the central Pacific of the most severe El Niño impacts, followed by a lull in the strength and occurrence of El Niño from around 6,000 to 4,000 years ago. A possible explanation for the surprising finding of a strong El Niño 10,000 years ago was that another factor was compensating for the dampening effect expected from cyclical changes in Earth’s orbit around the sun during that period. “The best candidate is the polar ice sheet, which was melting at a substantial rate in this period and may have increased El Niño activity by changing ocean currents,” Carré said. Approximately 6,000 years ago the majority of the ice age floes would have finished melting, therefore the effect of the Earth’s orbital geometry may have taken over to enable the period of weak El Niños. In previous studies, warm-water shells and evidence of flooding in Andean lakes had been interpreted as signs of a much weaker El Niño approximately 10,000 years ago. According to Carré this novel data is more reliable, for three reasons: the Peruvian coast is strongly affected by El Niño; the shells record ocean temperature, which is the most important parameter for the El Niño cycle; and the ability to record seasonal changes, the timescale at which El Niño can be observed. The US National Science Foundation, the US National Oceanic and Atmospheric Administration and the French National Research Agency funded the research. Other co-authors of the paper are Sara Purca at the Marine Institute of Pero; Andrew Schauer, a UW research scientist in Earth and space sciences, Pascale Braconnot at France’s Climate and Environmental Sciences Laboratory, Rommel Angeles Falcón at Peru’s Minister of Culture; and Michèle julien and Danièle Lavallèe at Frances’s Renè Ginouvès Institute for Archaeology and Anthropology.